Give young women of Los Angeles a camera. Teach them to be photographers and they’ll go far, pushing past the boundaries of expectation to express and share their unique view of the world. 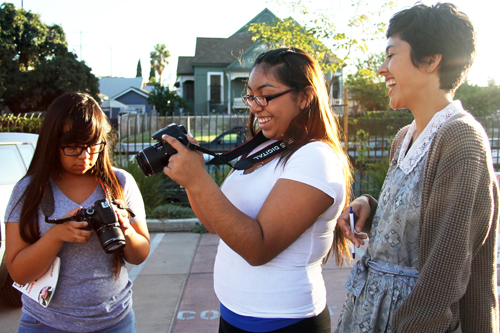 That’s the idea behind the Las Fotos Project that started in LA’s Boyle Heights neighborhood four years ago. A push to expand that mission outside Los Angeles continued Thursday as lessons for young women photographers began for the first time in Tijuana, Mexico. “A lot of people in California seem to be unaware of Tijuana – maybe they come down to party or to go to the beach but culturally it’s not known for much more than that, at least from a U.S. perspective,” said Rebecca Goldschmidt via e-mail to Through the Cracks, the Las Fotos Project Tijuana campaign organizer. Goldschmidt lives in Tijuana and decided to start lessons there because of its size and proximity to the United States. 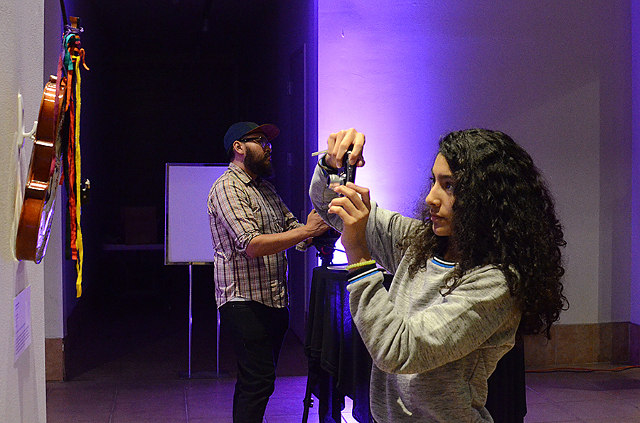 Maya Rosado, 12, takes pictures of art hanging at the Viva La Muxer event with a camera she was given by Las Fotos as a student. “(LFP) shows you how to take good pictures, make friends and they give us cameras to use too.” Credit: Carlos A. Moreno. Textli “Teshley” Gallegos, 16, took photos of guests coming into the benefit. “The program has opened up my eyes to the possibility of going into photography not just as a hobby but as a career, maybe a field like journalism.” Credit: Carlos A. Moreno. The work of some Las Fotos photographers was on display at a gallery in Long Beach earlier this month that had a swanky feel to it. A large spotlight hit the entrance of the Museum of Latin America Art (MOLAA). Translated in English as “Long Live Women”, the “j” in Mujer was replaced with an “x” as a tribute to Chicano heritage, history and culture. Rebecca Goldschmidt mentoring her students at Boyle Heights in Los Angeles. “I literally Googled ‘photography tutor Los Angeles’ and Las Fotos website popped up! 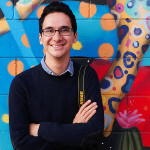 I was looking for a way to integrate my past experience as a tutor and a photographer in a way that would promote visual literacy with youth.” Credit: Las Fotos Project. Las Fotos Project was started in 2011 according to founder and executive director Eric Ibarra in a phone interview with Through the Cracks. 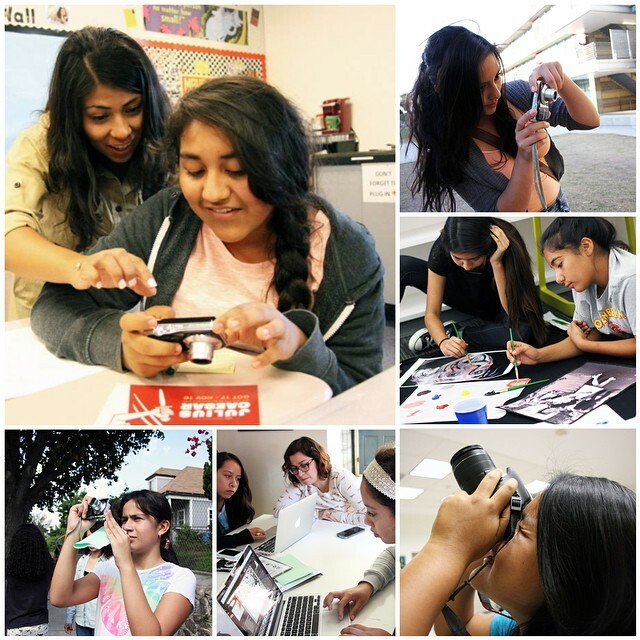 The original idea behind the Las Fotos Project, said Ibarra, was to give young girls the chance to learn a new skill and be able to document their community through photography. Since then some support for the project and its expansion has come from crowdfunding, Ibarra said. In June 2014 Las Fotos used Crowdismo to raise about $2,500. Crowdismo is a Latino crowdfunding platform for Latino-like minded creators and organizers who focus on Latino projects. The money paid for their summer program, which included free art mentorship, computers, cameras from point-and-shoots to DSLRS and weekly mentorship for its students. Before that, to bring a public art element to Las Fotos operations in Guatemala, the nonprofit used GoFundMe to raise more money. When Ibarra approached Goldschmidt to start a branch of LFP in Tijuana, Las Fotos decided to go back to crowdfunding for their third campaign. “LFP has used GoFundMe in the past, we appreciate that it’s independent and not owned by Amazon. I would definitely recommend GoFundMe for its simplicity, obviously they are taking a chunk of the donations but the open-ended timeframe option is great, the fact that you don’t need to offer incentives is liberating (although we are offering incentives),” Goldschmidt said, who recently moved to Tijuana. In choosing a crowdfunding platform, Ibarra said the ability to retain funder contact information was key because some platforms don’t allow campaign creators to keep information like phone numbers, e-mails and addresses and mailing addresses. 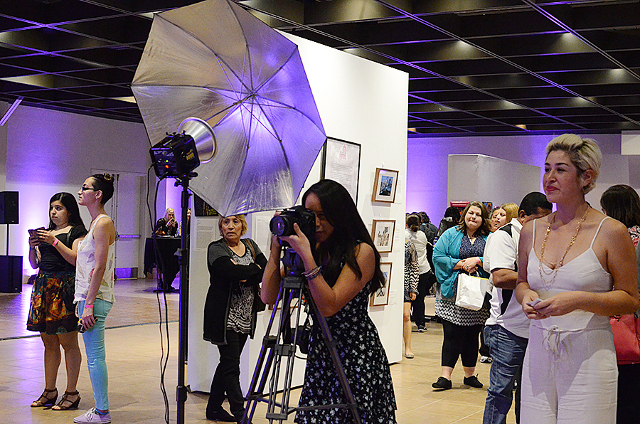 “Viva La Muxer” event at the Museum of Latin America Art (MOLAA) in Long Beach, Calif. The event functioned as an early celebration for International Women’s Day and a benefit for the Las Fotos Project. Credit: Carlos A. Moreno. 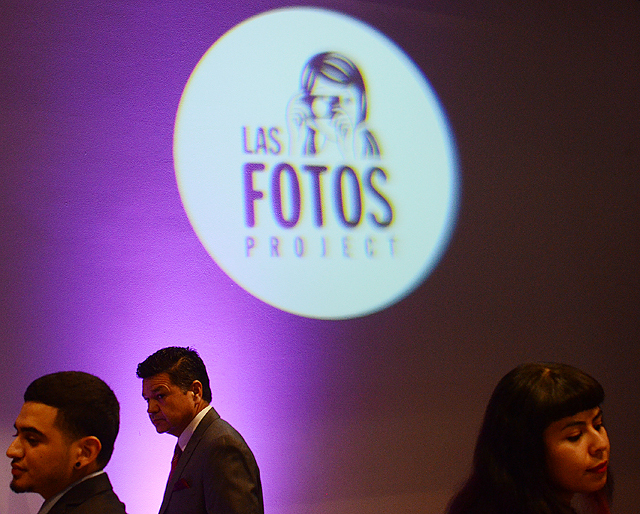 But crowdfunding doesn’t mean organizations like Las Fotos Project can interacting with donors and supporters. The need to engage people is still there. “It is essential for us to have this information, which is why such events [like Viva La Muxer] help us spread the word from the bottom up, not just through crowdfunding,” he said. Las Fotos uses crowdfunding occasionally but it isn’t their only form of funding, Ibarra said. Community engagement, mentors and volunteers are also an important part of Las Fotos’ survival. To see some of the students work from Las Fotos Project, you can check out their work on LFP’s Tumblr page lasfotosproject.tumblr.com.